The Beomaster 8000 still remains the most powerful receiver ever produced by B&O. It was also the largest and amongst the most expensive. As well as bringing new levels of performance and quality, the Beomaster 8000 also introduced a new range of features that would remain in subsequent models until B&O ceased to produce Hi-Fi separates components. Text copyright © Beocentral. Unauthorised reproduction prohibited. What made the Beomaster 8000 different from the previous models was the large increase in power and the use of microprocessor technology. These two things gave the new model a unique character and returned B&O to the very top of the league in terms of high quality amplification, a position that it had last occupied over ten years previously with the Beolab 5000/Beomaster 5000 system. Text copyright © Beocentral. Unauthorised reproduction prohibited. There was more to the amplifier sections of the Beomaster 8000 than just a lot of power. Throughout the amplifier, new techniques were used to ensure that the resulting quality of the system as a whole was as high as was obtainable. The pre-amplifiers used integrated circuits throughout, which were powered from dual split supplies. This technique was more commonly found in instrumentation and studio equipment and had not been seen before in a Beomaster. The use of these integrated circuits allowed a large amount of gain to be achieved with minimum distortion. It also allowed complex filters to be implemented with comparative ease, allowing the response of the amplifier to be tailored accurately to the designer’s (and listener’s) requirements. As well as providing accurate RIAA correction for LP records, the pre-amplifier also included two extra switchable filters, bass and treble controls and switchable loudness compensation. As with the Beomaster 4400, all the filters could be switched out to provide a “flat” response, either directly on the set or by remote control. Text copyright © Beocentral. Unauthorised reproduction prohibited. The volume control was also of a new design. For the first time in a Beomaster, electronic attenuators replaced the traditional mechanical volume control. There were a number of advantages to this arrangement, including precise matching to the gain of the two channels at all levels, ease of remote operation and the ability to define the precise “law” of the control so that accurate adjustment of the volume could be made at low levels whilst large amounts of power could also be summoned relatively easily. Text copyright © Beocentral. Unauthorised reproduction prohibited. The pre and power amplifiers of the Beomaster 8000 were connected via external links so that they could be used separately or with extra filters and equalisers in between. The power amplifiers built upon the principles already used in the Beomaster 4400 but offered twice the power. This was achieved in part by using six (rather than the previous four) power transistors in each channel and by raising the supply voltage to a total of 110V. Uniquely amongst Beomasters, including those yet to be designed, the Beomaster 8000 power amplifier was built using the “dual mono” technique, where each amplifier was a separate physical entity, along with all its wiring and power supply. The only common part was the mains transformer (an oversize toroidial device which was mounted centrally in the Beomaster chassis and fitted with its own heat sink), though this did have two separate secondary windings, one for each channel. The dual mono technique minimised the interaction between that amplifiers to the fullest possible degree so that no matter was required of one, it could not affect the other. This ensured the integrity of the stereo image, regardless of the listening level. Text copyright © Beocentral. Unauthorised reproduction prohibited. The sophisticated amplifier was protected by various safety devices. Overloading and overheating were protected against by electronic circuits and the order in which the various power supplies were established at switch-on was carefully controlled, as was the order in which power was removed on switch-off, something that made the use of the “stand by” function mandatory. Simply pulling out the mains plug was not recommended as the loudspeakers could easily be damaged. The power supply held such a large energy reserve (essential for the accurate reproduction of musical peaks) that the power had to be applied to the transformer in two stages so that the domestic fuses and wiring were not damaged. Text copyright © Beocentral. Unauthorised reproduction prohibited. The microcomputer control system was the other important innovation in the Beomaster 8000. This was used to allow comprehensive remote control of all the major functions, digital tuning of the FM radio and to allow interaction with the other components in the system (tape recorder, record player). Although the digital tuning was new, various remote control systems and interconnections between equipment had been seen before in the B&O range (e.g. Beomaster 6000 4 channel, and Beomaster 2400-2). While these previous systems had used digital techniques, their operation was determined by the design of the circuits. The Beomaster 8000 introduced the idea of software control, where the operation of the system was sequenced by a computer program. This allowed the interconnections to be made more subtle, and the remote control more useful. The “user interface” of the Beomaster 8000 consisted of a keyboard and two rotary controls along with four LED numerical readouts and four illuminated indicators. Further controls and a radio signal strength meter/FM stereo indicator were hidden under a large metal flap at the upper left of the fascia, which could be opened by touching the black strip beneath it. The main keyboard had keys to select 9 pre-set FM radio programmes, a turntable and two tape recorders, along with a long bar for stand-by. The two large wheels controlled the volume and the tuning. The operation of these was sensed optically so their travel was not limited, though the volume wheel was damped with heavy oil so that it could not be spun too easily. Text copyright © Beocentral. Unauthorised reproduction prohibited. The radio was tuned by simply turning the “frequency” wheel. The frequency to which the radio was tuned was shown in the display and as this was derived by measurement from the radio circuit it was unfailingly accurate. Two tuning modes were available, “manual”, where the tuning followed the wheel precisely, and “automatic”, where the receiver would search and lock onto receivable stations in the direction that the wheel was turned. Nine stations could be stored for instant recall via the nine keys on the main keyboard. The tuning meter could be used to either assess signal strength or the level of multi-path distortion. Oddly, despite the use digital displays and controls, the tuning meter was a traditional moving-coil type. Text copyright © Beocentral. Unauthorised reproduction prohibited. The other digital displays showed the sound source (or preset tuning number), volume setting and balance. The indicator lamps warned that mono operation had been selected, that the tuning was set to manual mode, that the filters and tone controls were in-circuit and that the amplifier was being driven to the extent that “clipping” distortion was occurring. Text copyright © Beocentral. Unauthorised reproduction prohibited. The microcomputer control of Beomaster 8000 introduced a new concept to B&O’s range of tape recorders and record players: Datalink. This allowed data to be transferred between the equipment and was used mainly for automatic source selection and increased remote control capabilities. Datalink worked in both directions, so that pressing “play” on a source component would turn on the Beomaster and select the correct input, and choosing a source on the Beomaster or the remote control would turn on that source and start it playing. Datalink was a standard, so any combination of units (providing that they made up a complete system) would work together. The first two sources to support this system were Beocord 8000 and Beogram 8000, though many more would follow over the years. The connection for the second tape recorder to the Beomaster 8000 did not include Datalink and had its levels adjusted to suit older equipment (such as the Beocord 5000). The Beocord 8000 at last ushered into the B&O range the idea of using “line” level connections between a receiver and a tape recorder, reducing the noise and allowing longer cables to be used. The Beomaster 8000 thus provided a “line” level signal for the main tape recorder. Even though the main recorder connection (TP1) was intended for use with a Datalink-equipped machine, there was a facility to use it as a “tape loop” for three-headed machines for off-tape monitoring. When it became clear that B&O was not going to produce something suitable to use with this, the Beomaster 8000 was modified and the monitor function was transferred to the second recorder connection (TP2). Text copyright © Beocentral. Unauthorised reproduction prohibited. 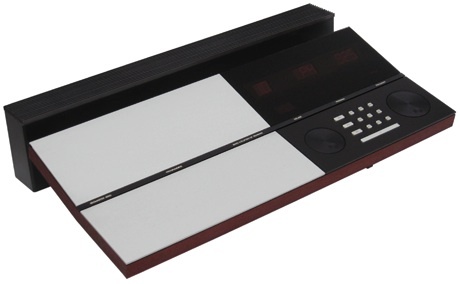 The Beomaster 8000 included infra-red remote control as a standard feature. The terminal provided was the Beolab Terminal, which offered comprehensive control of the amplifier, selection of the preset radio programmes and sources and basic control of a turntable and tape recorder. This represented a major advance over the ultrasonic system that had previously been employed. Text copyright © Beocentral. Unauthorised reproduction prohibited. The Beomaster 8000 was indeed a formidable piece of equipment and offered the possibility of excellent performance. That is not to say that it was without its drawbacks. Apart from the enormous cost, it was very large, very heavy and shaped so that it could not be stacked (something of which B&O did not approve). It was far too deep and heavy for conventional shelving and so special preparations had to be made to house it. Assuming that the owner would also buy at least one extra source (it is unlikely that anyone would spend the cost of the Beomaster 8000 and be satisfied with FM radio alone), the system soon became very large indeed. B&O’s answer was the System Cabinet SC80, which housed the system on two levels and left room for records, cassettes and accessories. Though beautifully finished and veneered, this unit had the unfortunate effect of turning the hi-if system of the future into what looked like the Hi-Fi system of the past, a radiogram. Later the SM80 (System Module) offered a more modern style, though a lot of floor area was still needed. Despite the size of the system, it was still dwarfed by the truly massive loudspeakers that B&O offered for use with it. The colossal Beovox MS 150 was the usual choice, and although it was well matched in most respects, due to its 8 ohm impedance it could not make use of the full output of the amplifier. The Beomaster 8000 was rated at 150W only into 4 ohms, the figure fell to 100W if 8 ohm loudspeakers were used. Text copyright © Beocentral. Unauthorised reproduction prohibited. The Beomaster 8000 represented a high point in the engineering of domestic audio equipment by B&O. It came the closest to offering professional performance in a domestically acceptable package and should be commended for that. The exercise was not to be repeated though, for a few years later the design goals changed from the pursuit of outright performance to making equipment that performed well and could be easily accommodated in modern homes and used by anyone. 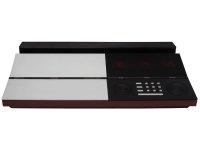 Designs such as the Beomaster 8000 are sometimes referred to as “signature” pieces that demonstrate what a company can do when most of the restrictions are removed. Recently, the introduction of the BeoLab 5 loudspeaker has shown a welcome return by B&O to this type of activity. Text copyright © Beocentral. Unauthorised reproduction prohibited.